An easy scramble. 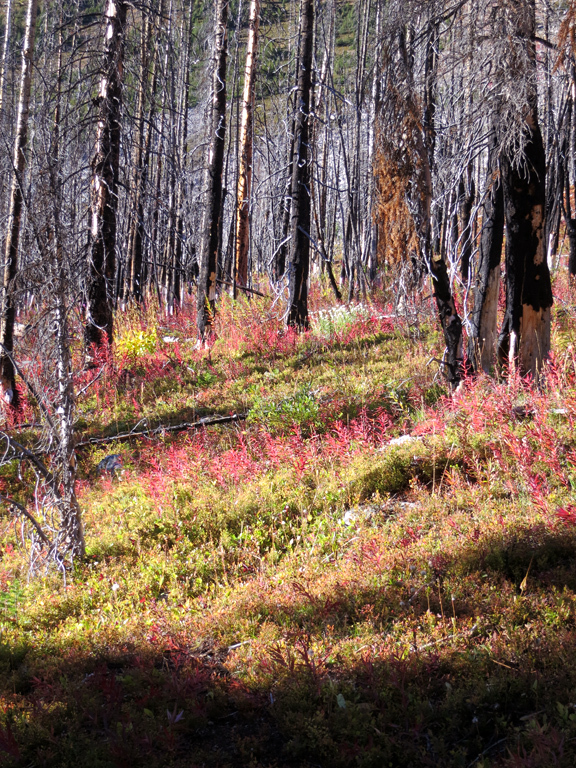 Watch for bears during the summer and avalanche risk in the winter. 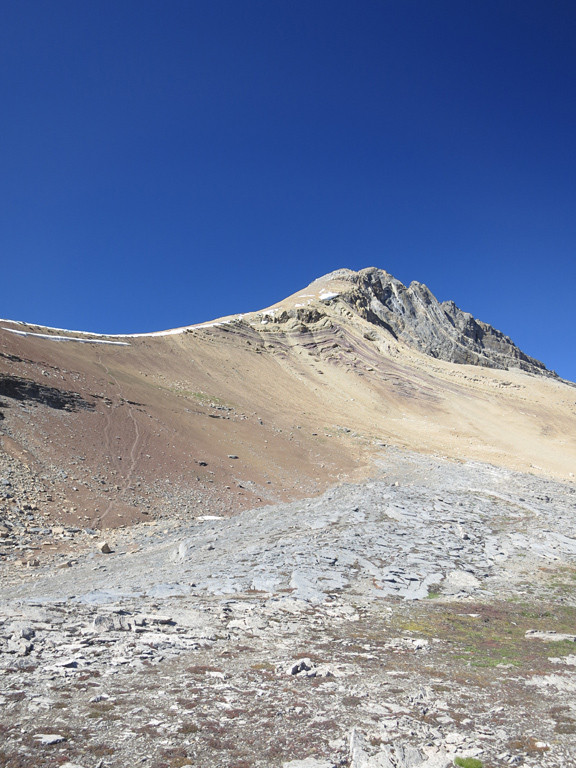 Cirque Peak is an excellent destination for those seeking to ease their way from alpine hiking into scrambling. 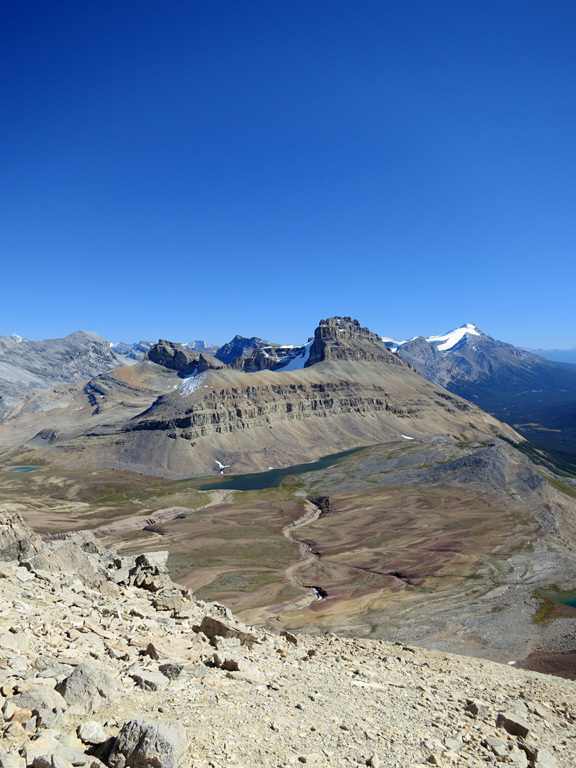 Mostly a hike, with only a minor rock band to surmount at the very summit, Cirque Peak is an easy scramble which is optimally positioned along the Icefields Parkway to provide great views in all directions. 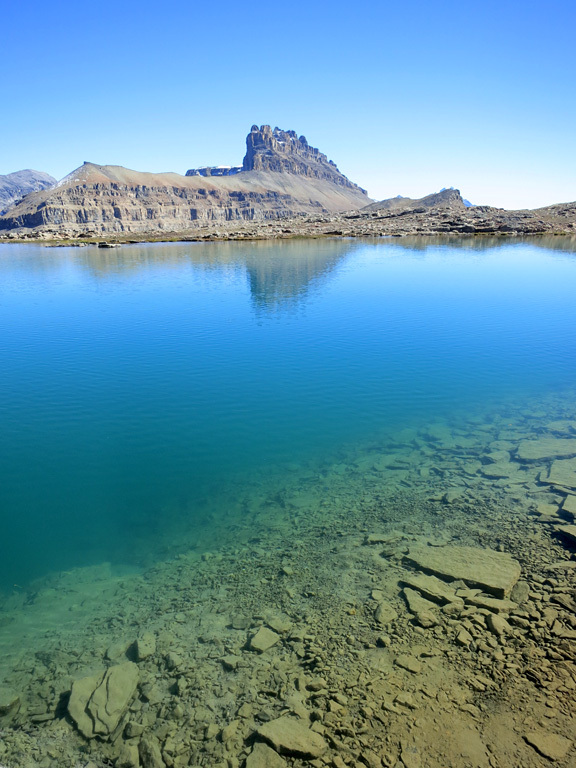 From its near-3,000m summit, one is treated to views of multiple lakes including Bow Lake, Helen Lake and Katherine Lake, the white expanse of the marvellous Wapta Icefields, and hundreds of peaks, including the likes of Mt. 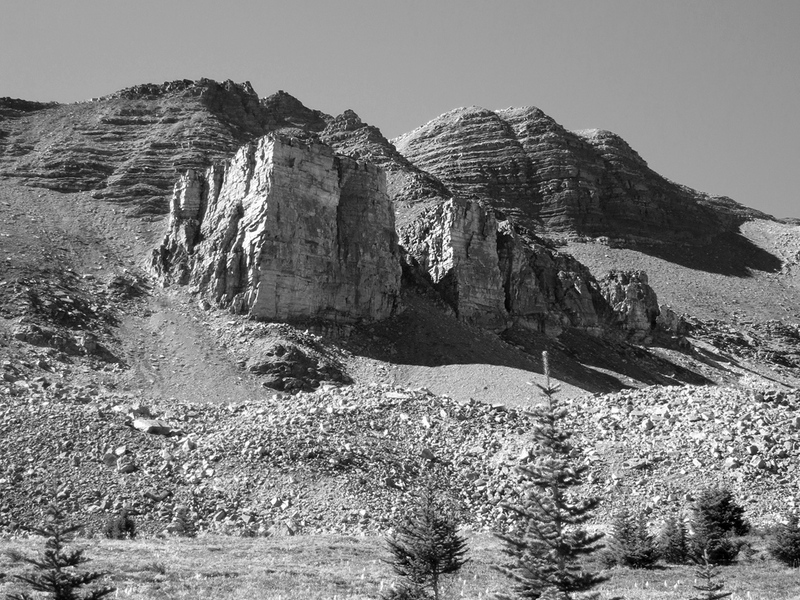 Chephren, Dolomite Peak, Mt. Hector, and the entire Lake Louise Group. 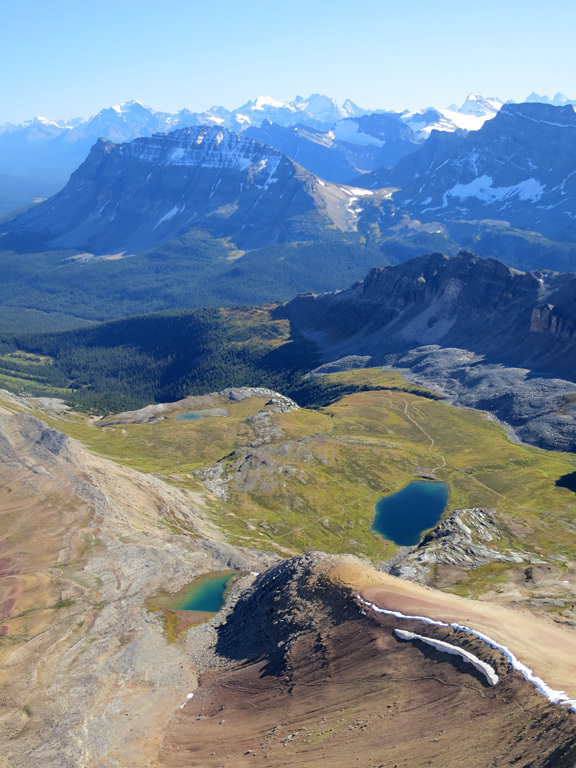 If that weren't enough, the colourful and highly textured plateau of Dolomite Pass at Cirque's feet could just as easily steal the show. This is definitely a trip you'll want to save for a good weather day. 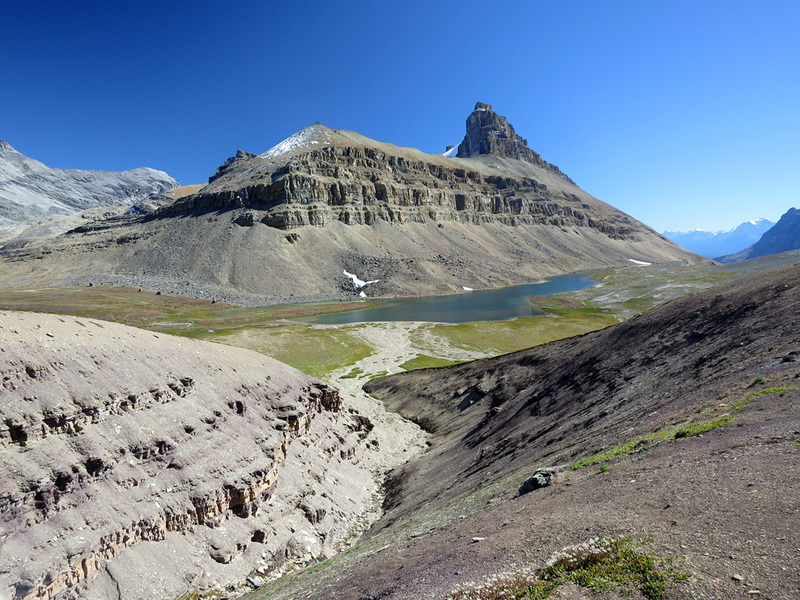 Cirque Peak can be reached from the Helen Lake Trail, which you'll find a signed parking lot for on the east side of the Icefields Parkway (Hwy 93), right next to Bow Lake, and roughly 30km northwest of Lake Louise. 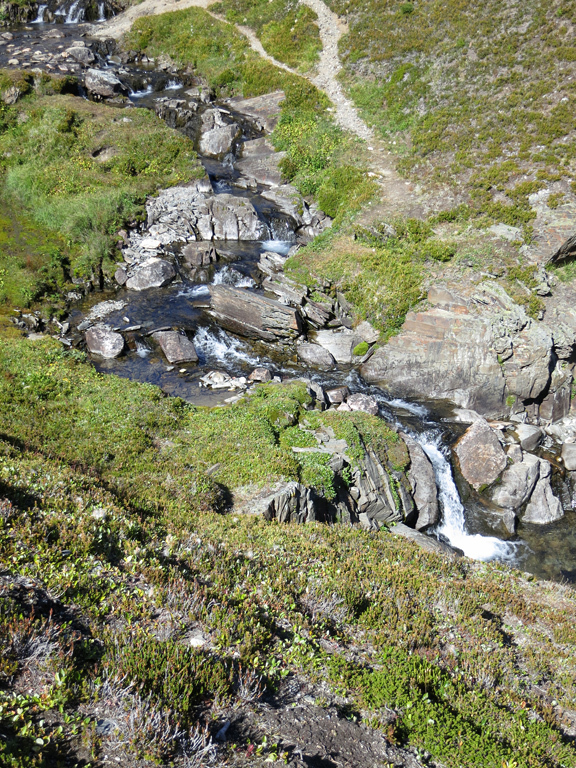 The first 3.5km of the trail is fairly uneventful as you follow a forest trail southeast around an outlying ridge. 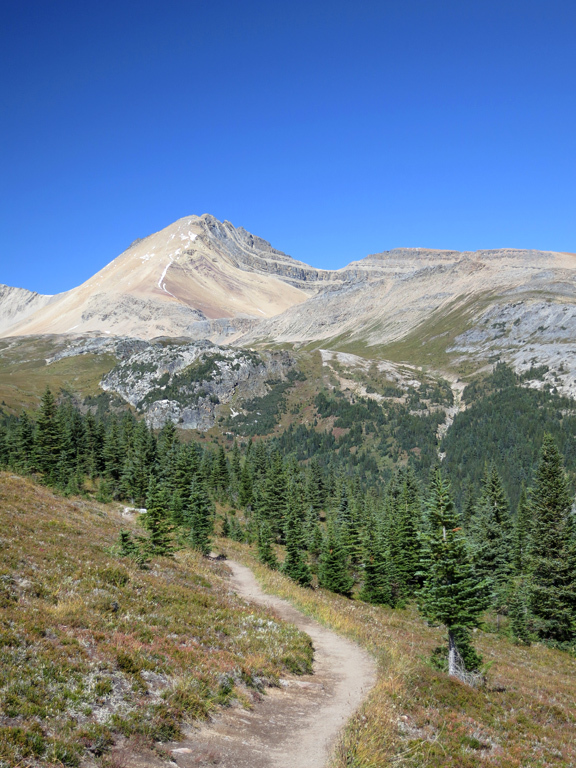 You'll know that you're nearing the end of this section once you've passed a recovering forest fire area and then broke through the trees to open slopes that provide the first decent views of Bow Peak and Crowfoot Pass to the south. 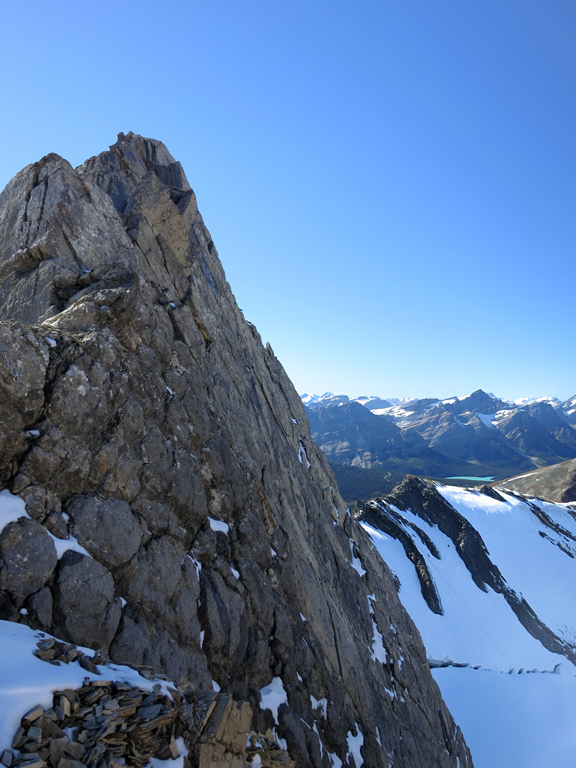 The views change considerably once you've rounded the ridge and begun heading north along a wide, open valley towards Cirque Peak with the stegosaurus-like western face of Dolomite Peak to your right. 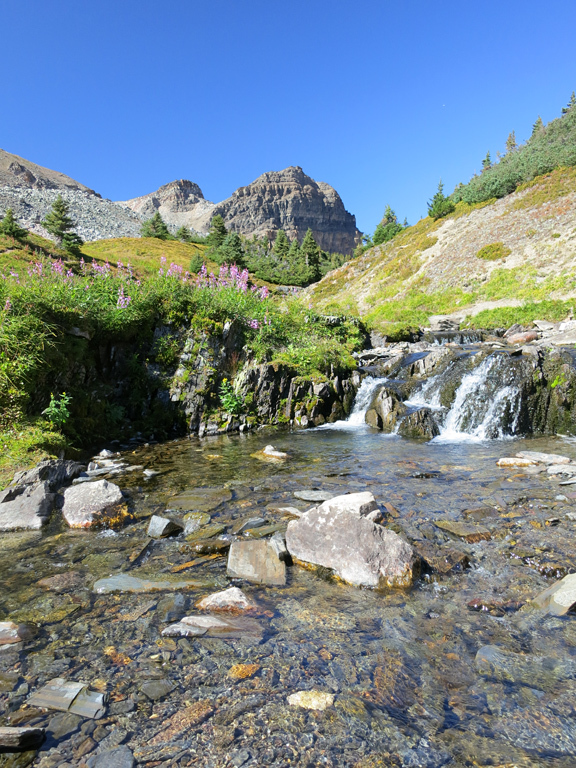 Gauging your progress through this section can be difficult as it may seem that the view never really changes, but you will eventually cross a small stream before open fields lead you to Helen Lake, which you won't see until you're literally about 50m away from it. After hearing a lot of great things about Helen Lake, I was really underwhelmed by this initial view. 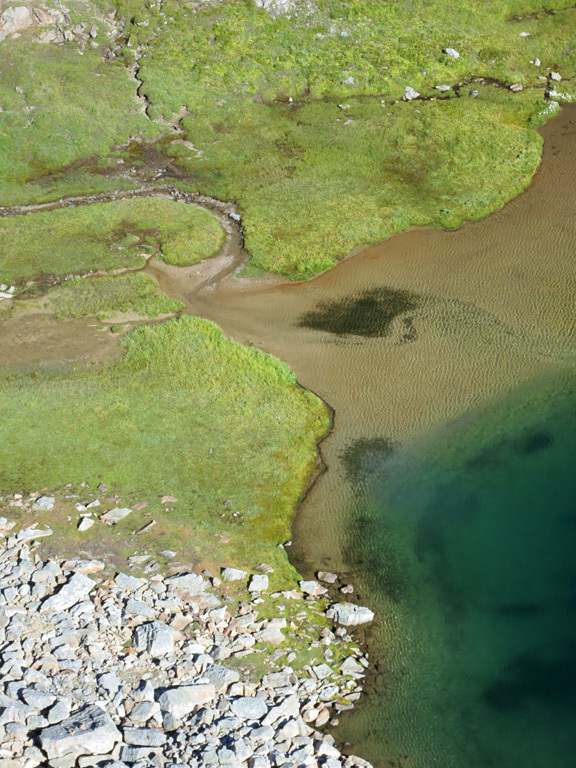 However, I would later learn (as evidenced by my photos) that the key with Helen Lake is to view it from above in the late afternoon light, where the colours and textures of the lake and its surrounding hills blend strikingly. 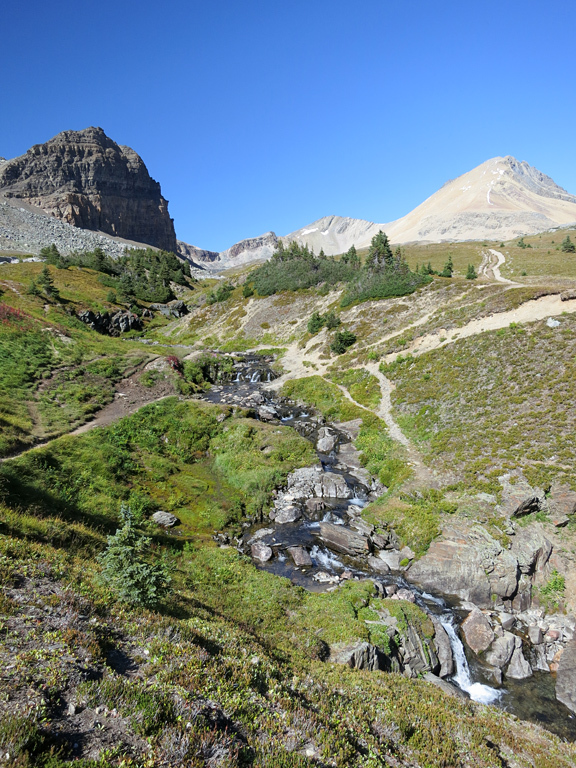 After enjoying a bit of a break at Helen Lake, follow the trail around its right (east) side and then up the switchbacks to Dolomite Pass. 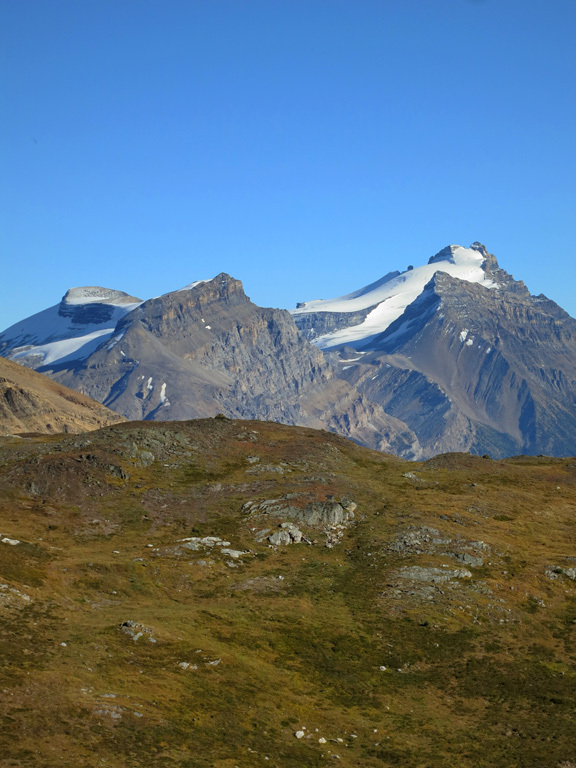 Once reaching the pass, many hikers will head to a cairned 2,500m highpoint on the climber's right and call it a day; but even if you're only looking to get a hike in, there are a quick pair of side-trips that I recommend in this vicinity. 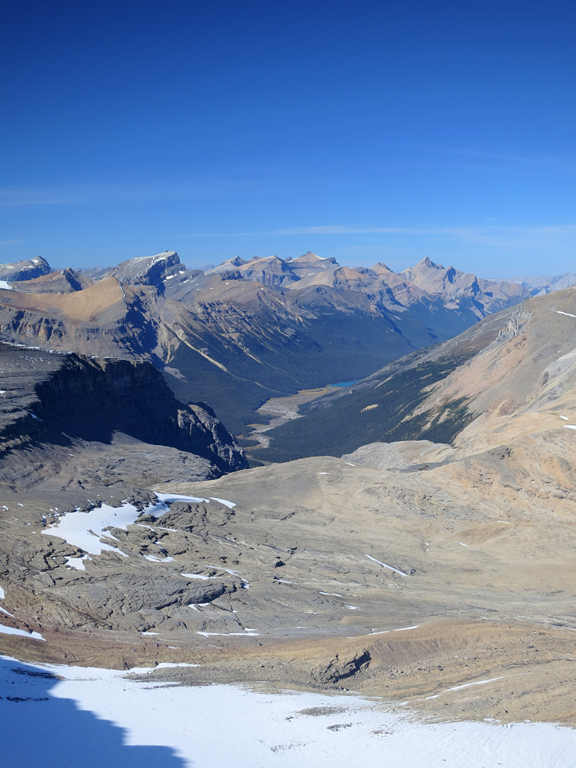 Looking back at Cirque Peak from the descent. The normal route follows the skyline from the right. 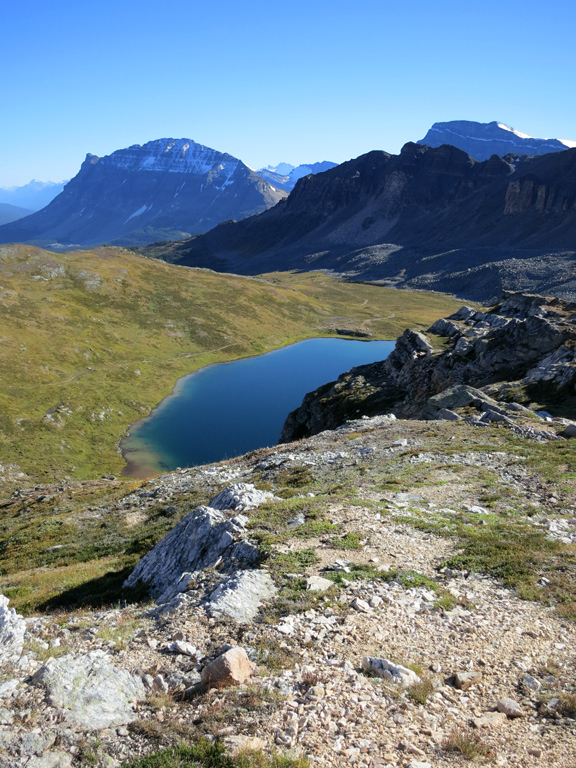 The first is to cut across the open fields of Dolomite Pass towards Katherine Lake (which is out of view at first but can be found at the foot of Dolomite Peak). 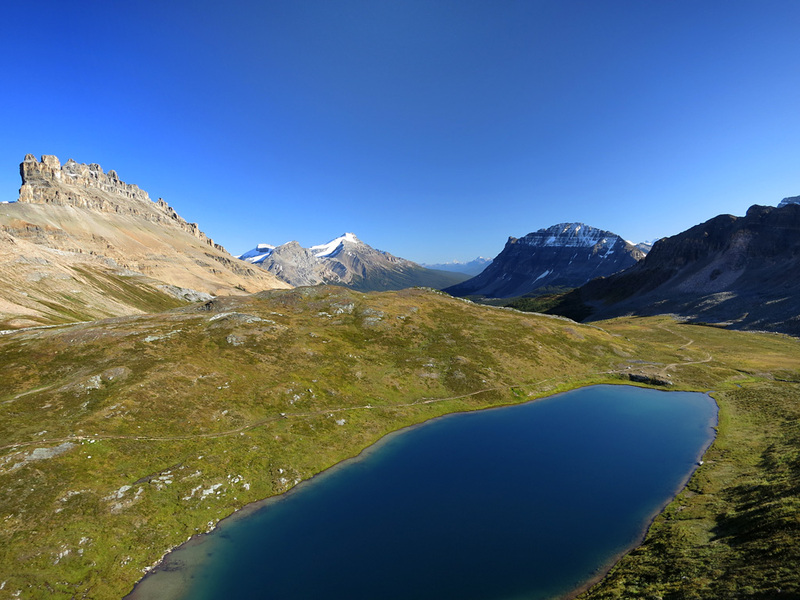 While I didn't go all the way to Katherine Lake, reaching the location of this photo only required about 1.5km of easy walking and about 20-30 minutes of my time. 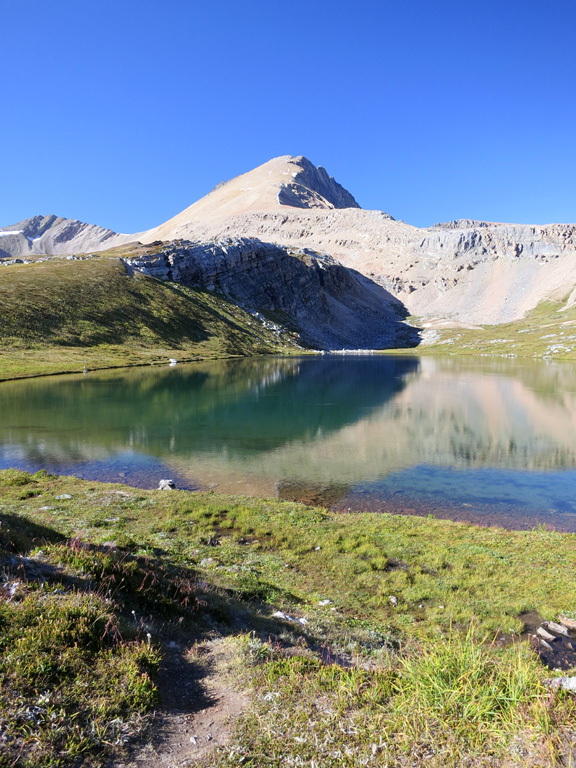 The second worthwhile side-trip is to a hidden tarn that can be found above, and just slightly northeast of where you top out when following the trail from Helen Lake to Dolomite Pass. 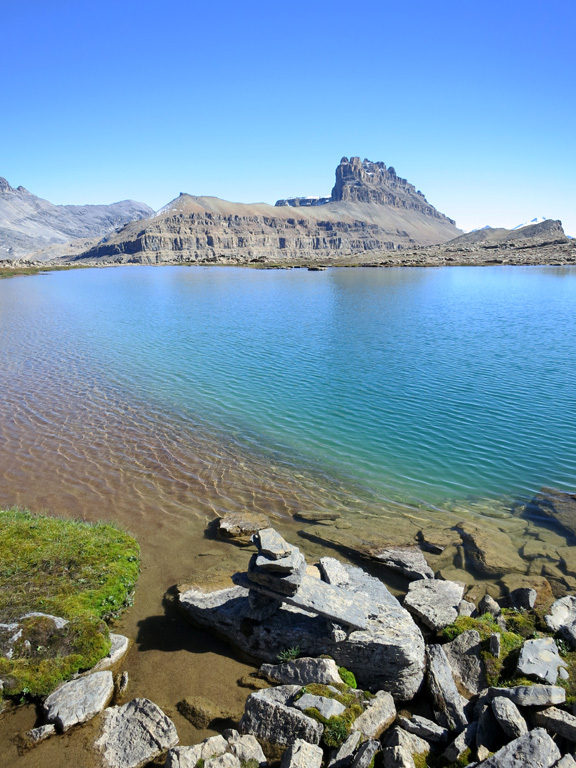 This tarn offers plenty of photographic possibilities, which I would have liked more time to experiment with. 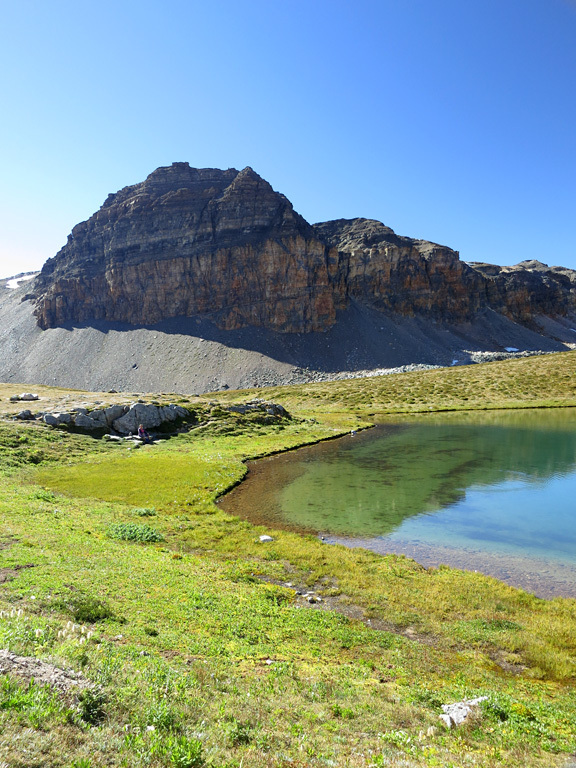 As the ascent route for Cirque Peak begins along an obvious trail just to the northeast of this tarn, those doing the scramble will have an additional reason for coming this way. The first third of Cirque's ascent follows a compacted trail on soft soil that's only a few notches above sand. 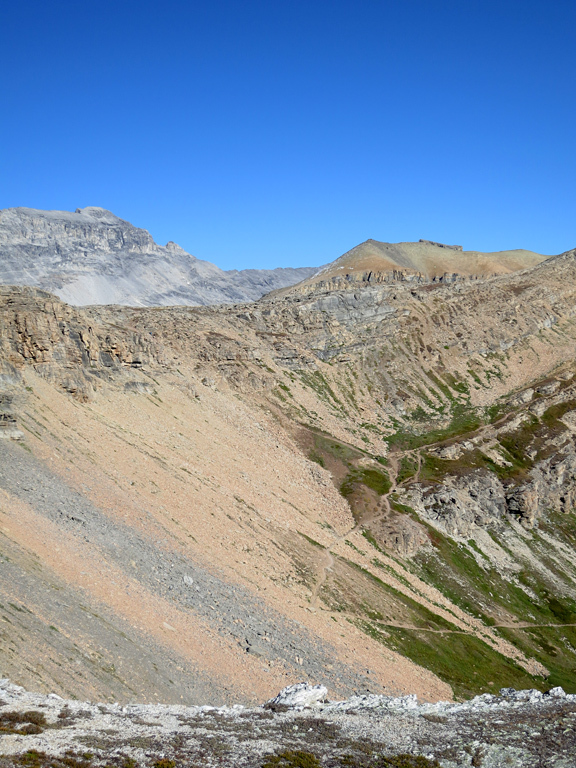 This trail travels parallel to the ridge crest while slowly climbing towards it, and my recommendation would be to look for a decent place to head directly up to that ridge crest once the trail gets within several metres of it. 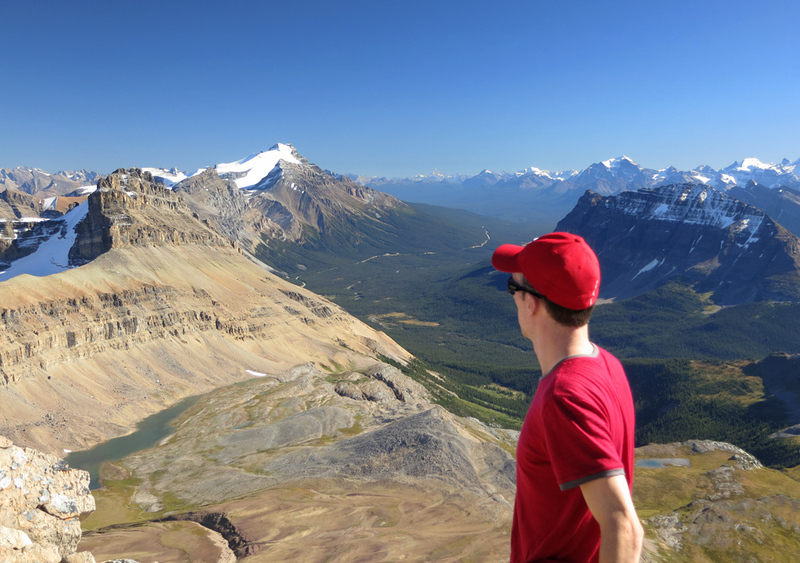 For whatever reason, the hordes that have helped forge this trail thought it would be fun to awkwardly side-hill for a few hundred metres instead of simply gaining the wide, relatively level ridge directly above it. Don't repeat their mistake. There can be lingering snow along the east edge of the ridge, but even if that's the case, you should be able to find a useable gap to sneak through. 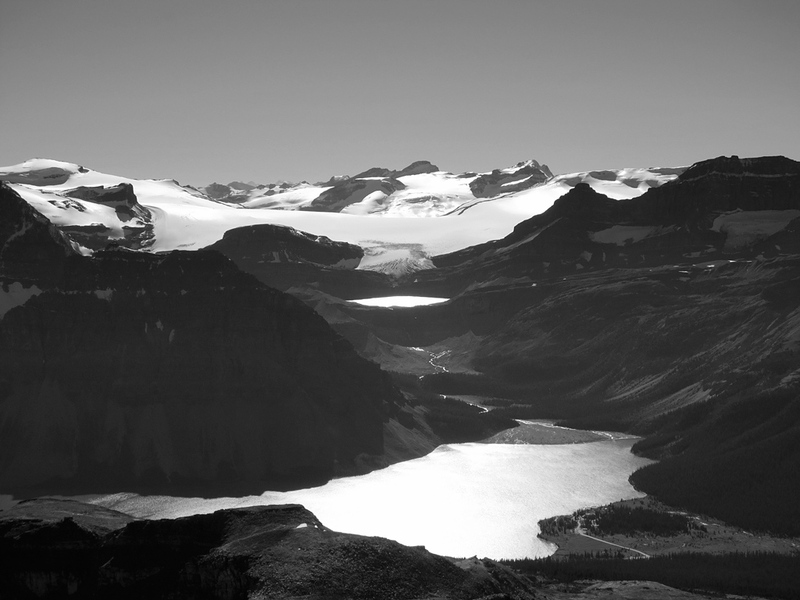 Katherine Lake and the striking, ship-like profile of Dolomite Peak from Cirque's lower ridge. 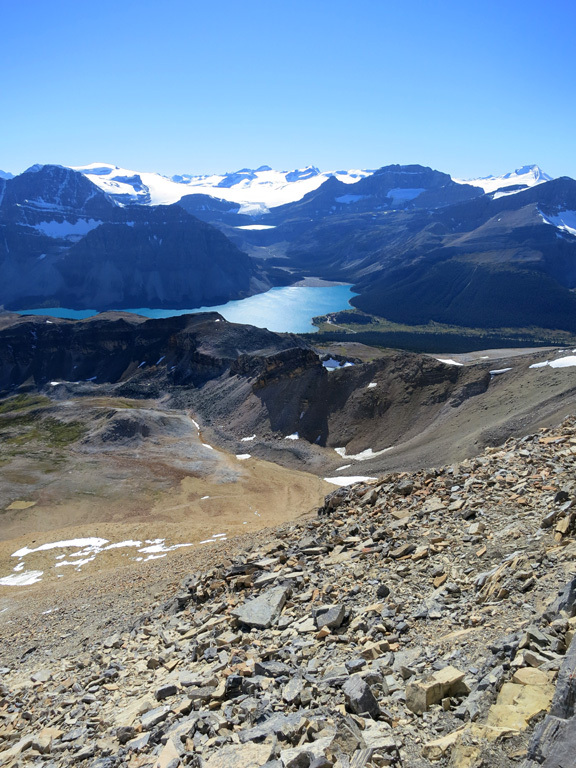 Once you're on the ridge, you'll have a clear view of the majority of what remains to be climbed, and it will involve following a series of switch-backing trails through loose scree and rock up to the false summit. 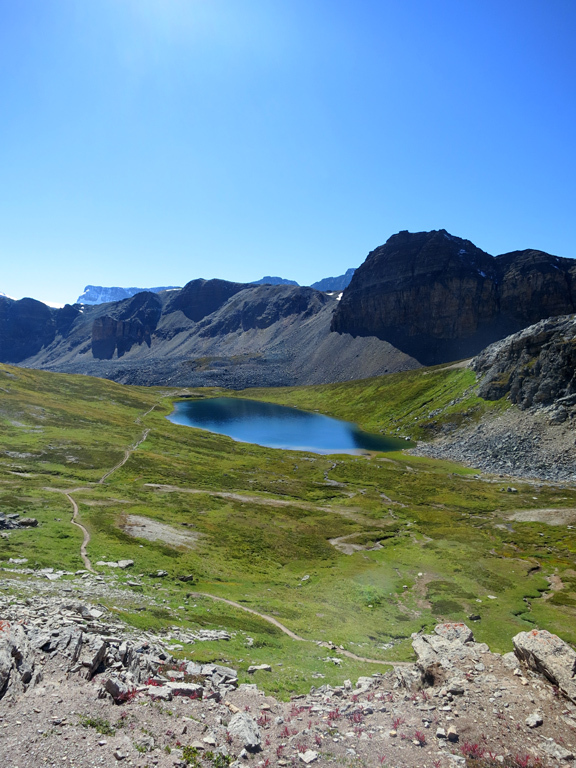 While this section can be rather tedious, at least you can always look behind you or to your left for the improving views of Bow Lake, Helen Lake, and the surrounding area. 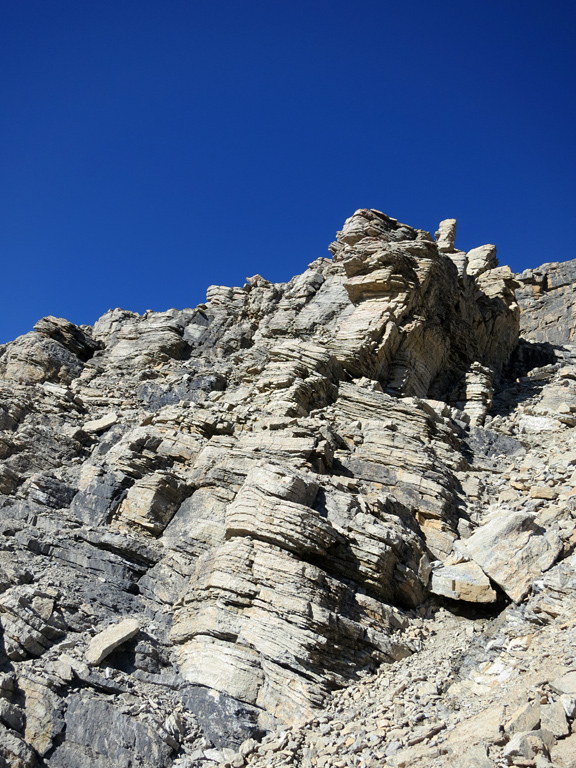 The loose scree gives way to mild scrambling upon reaching the false summit, and the trail should lead you directly to the rocky gully you'll want to climb. 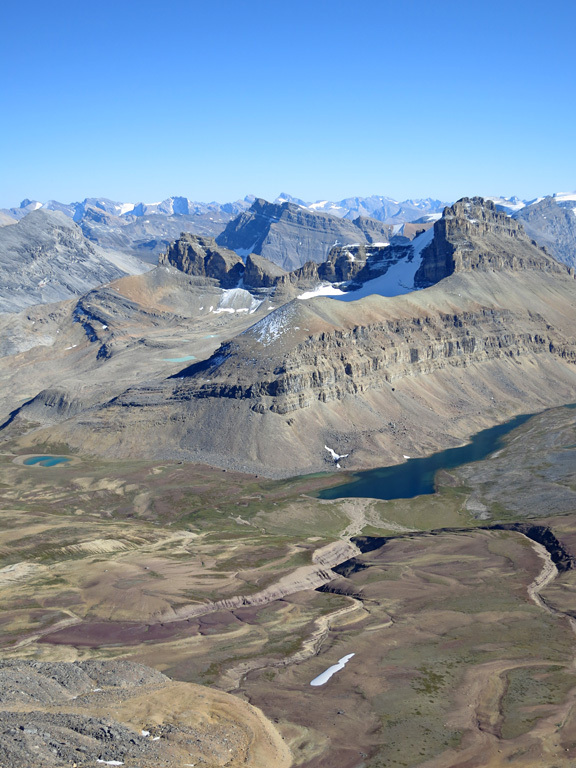 Soon you'll find yourself on the false summit with wide open views to the glacier and valleys to the north, and the best views you're going to get of the Bow Lake/Wapta Icefield area. The traverse to the true summit may look difficult, if not impossible (as a scramble) at first from here; however, you should have little trouble finding a gully that can be descended to the right (east) that leads to a short bypass and another easy scrambling section that will bring you to the very top of the mountain. 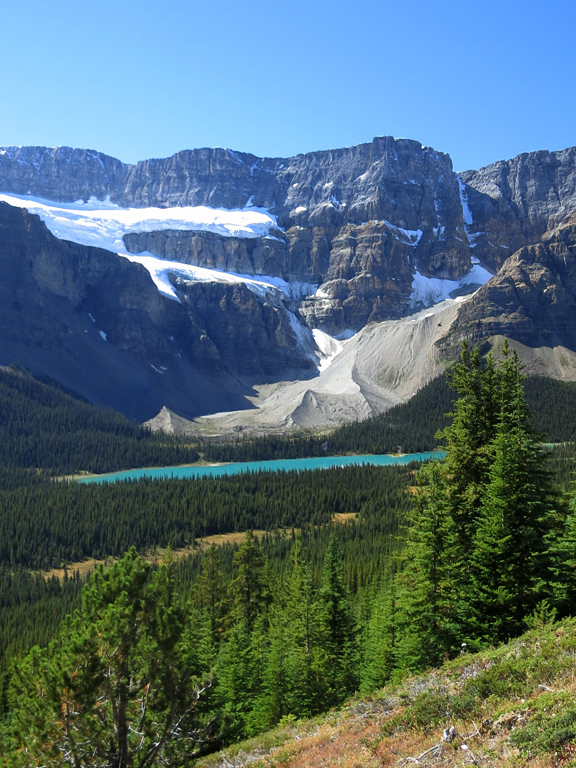 Once you've enjoyed a well-deserved break at the top, begin your return by retracing your steps to the base of the false summit. 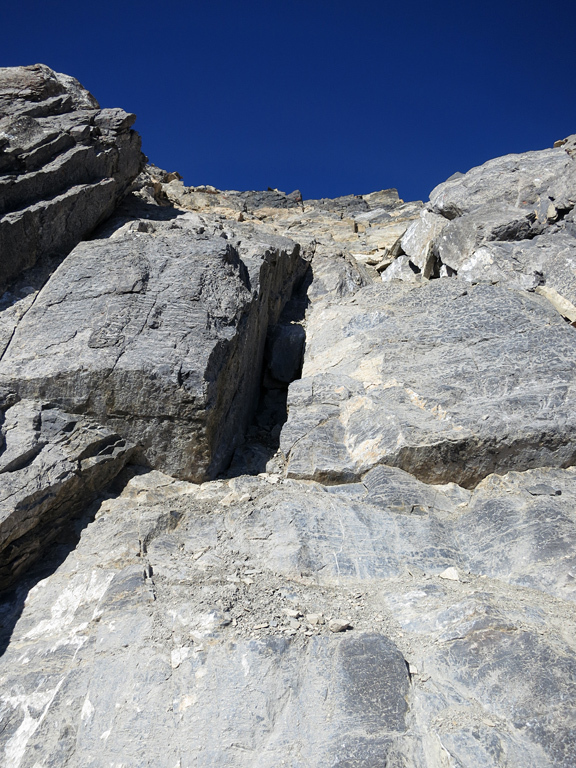 Instead of following the switchbacking trail down, look for scree channels beside them you can use to descend the south face speedily. Once you near the area with the side-hilling ascent trail you came up you're presented with two choices. 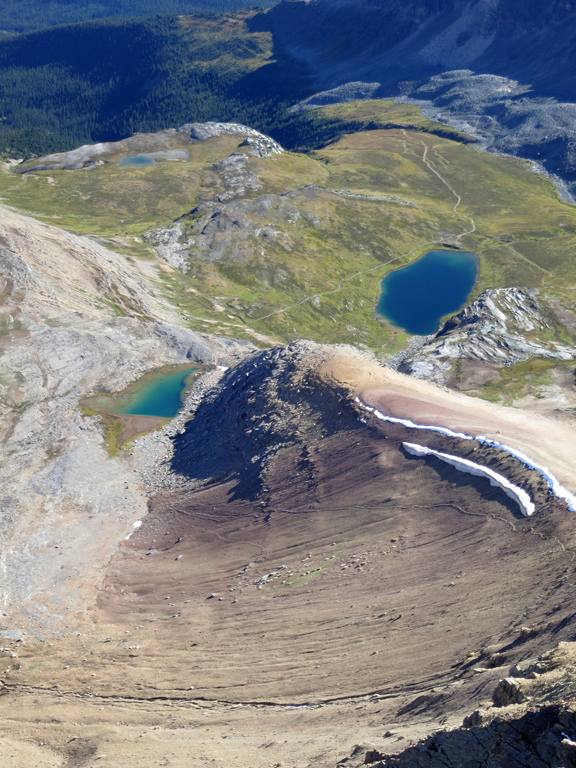 You can either take the easy way down, by retracing your steps on the trail leading down on the skier's left to the hidden tarn and Dolomite Pass; or, you can take the scenic route by dropping off the ridge to the skier's right. 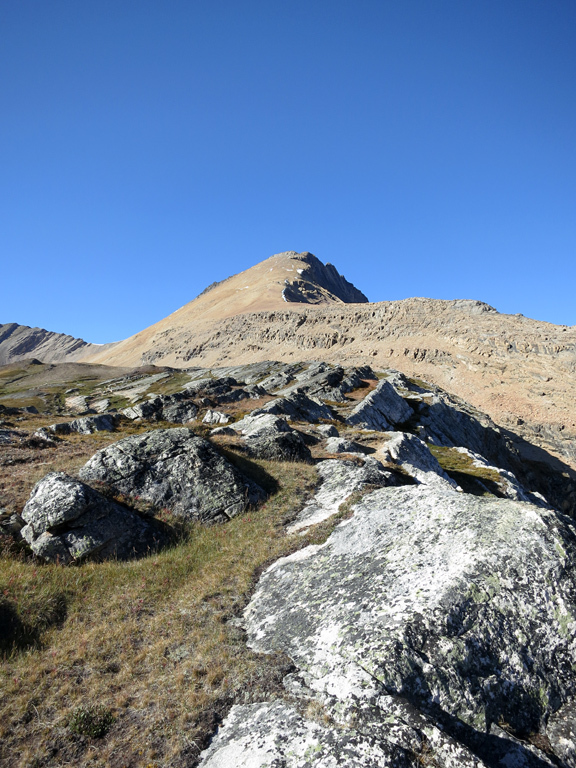 Howse Peak, White Pyramid and Mt. 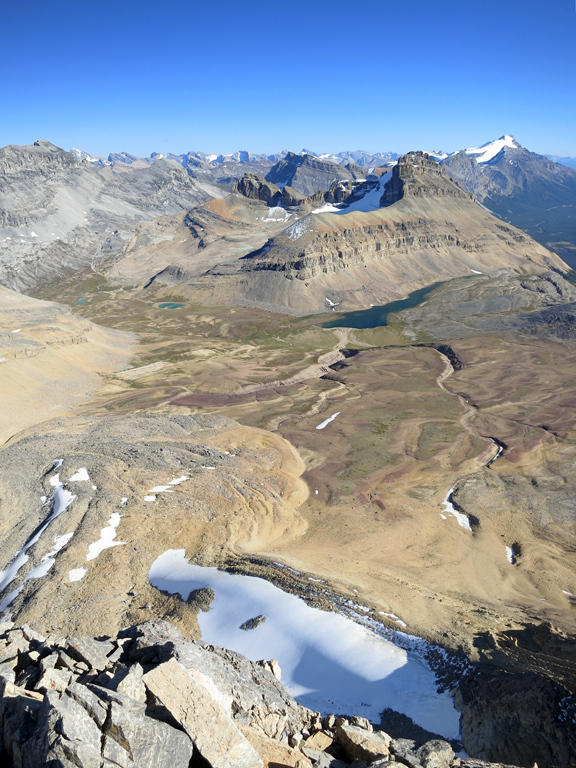 Chephren are some of the highlight peaks viewable from Cirque's Summit. 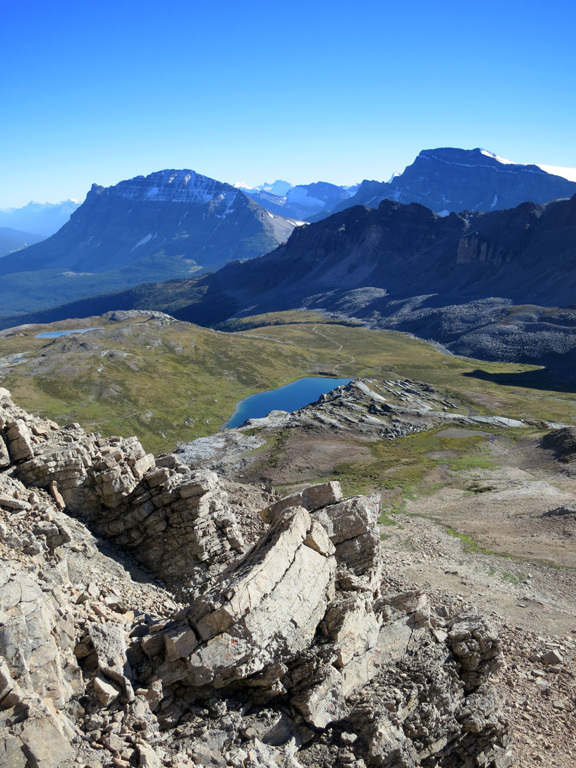 The scenic route is a little more challenging as you will need to find a good route off of Cirque's southern ridge, through a rock band, and down to a plateau above Helen Lake. The rock here is pretty loose, but shouldn't prove too difficult. 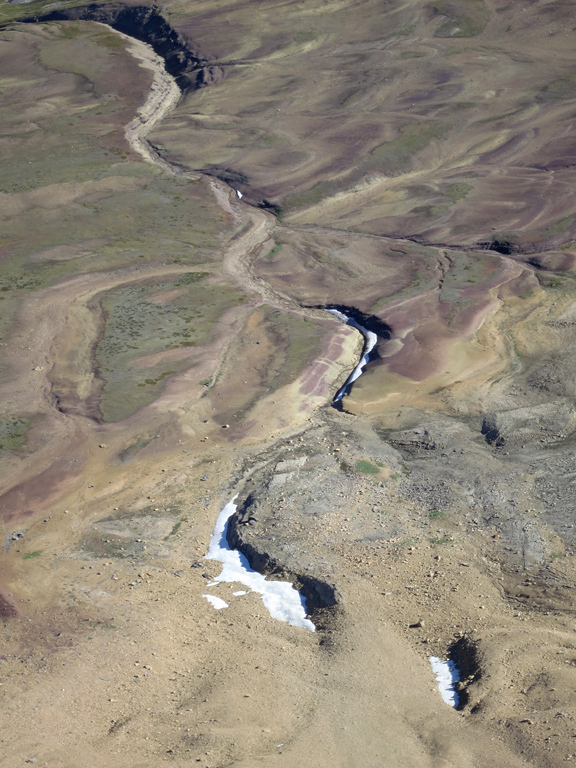 I don't have a photo of the route I took, but I recall using a gully that descended southward, parallel to the ridge crest, and then opened up to the west about halfway down. 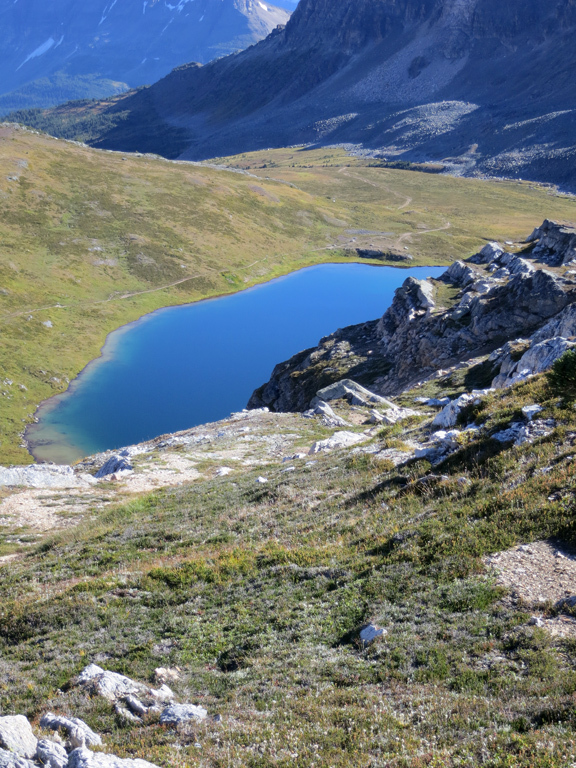 Once you're past the rock band, angle towards the white rocks to the south and then enjoy the great views of Helen Lake as you circle its north shores from above, eventually descending along an easy slope back to the Helen Lake Trail. From here to the trailhead requires 6km of easy, downhill hiking. 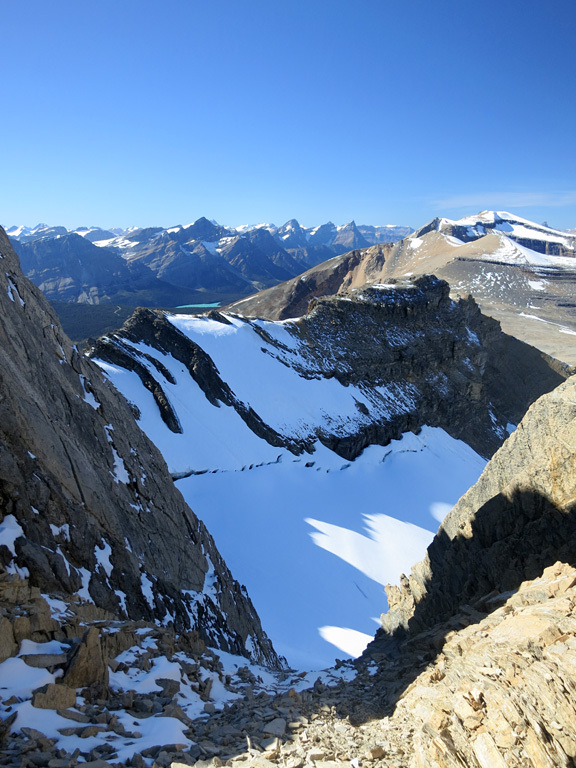 The ascent of Cirque Peak is also described in Alan Kane's Scrambles in the Canadian Rockies (pg.297). 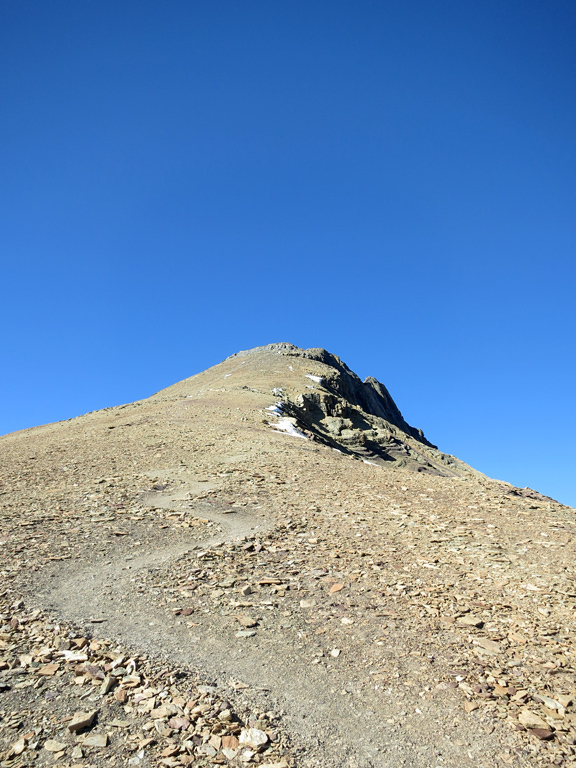 Summit: 3,373 m / 11,066ft. 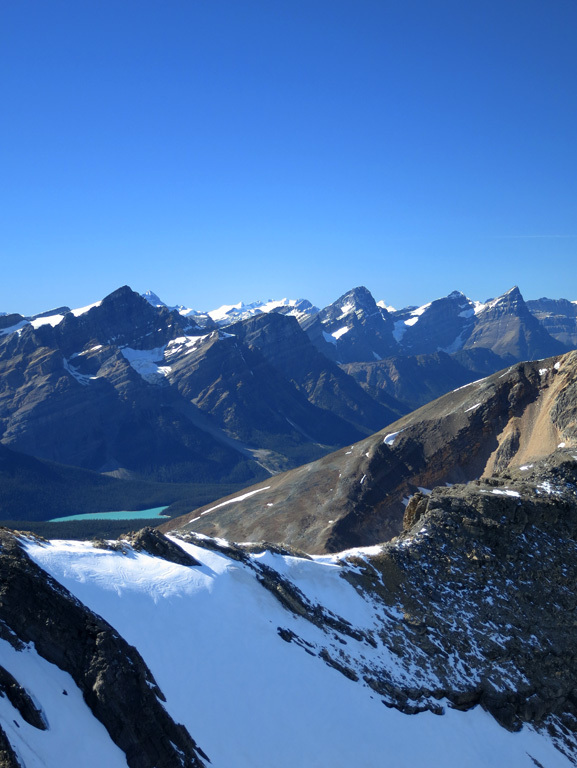 Summit: 3,280 m / 10,761ft.